Proficiency, the state or art of being proficient; performing in a given art, skill or branch or learning with expert correctness; adept, skillful. That's what it meant to Mr. Webster. What does it mean to you? Proficiency gets a lot of attention in the military environment. You'll hear it talked about in the squadrons, at flying safety meetings, at the alert facility, and of course, at the bar. Basically, the discussion boils down to the fact that with the flying hours each of us are allotted each month, it's a real challenge to stay proficient, or skillful, in our flying machine. The military realizes this, and through major command, wing, and squadron specifies what is necessary to maintain proficiency. There are currency items, and each must be accomplished over a period of time. By accomplishing our command-directed events (CDE) and wing directed events (WDE), we attempt to maintain a level of proficiency. Completion of the events Is documented for us in the computer, and we can conveniently monitor our requirements at any time. Where does this leave our friend the private pilot? There are more than 4,OOO blue suiters participating In general aviation, with Air Force Aero Clubs alone. Proficiency is much more individual and personal in the general aviation community. The private pilot is master of his own destiny there. The Federal Aviation Administration (FAA) has established requirements for takeoffs and landings, but, they are minimal. Perhaps the coldest hard fact of all in the private pilot world is that proficiency can be linked directly to your dollars. With fuel and maintenance costs continuing their upward spiral, the cost of general aviation flying grows higher and higher. Dollars are something we seem to have less of these days, and there are many necessities competing for those dollars. That means much less Is left over for the luxuries such as private flying. Does the private aviator really need to fly much to maintain proficiency? General aviation airplanes are far simpler than the Air Force's complex bomber, fighter, and transport aircraft. However, as simple as the aircraft may seem to be, it would be naive for any of us to believe that the airplane can't kill you. It definitely can and does, as accident statistics for general aviation operations point out each year. So, what are you general aviation aviators to do? We know you are faced with limited funds and, in many areas of the country, limited good weather in which to fly. What you must do is fly smarter! There are several things you can do to make the most out of the time you fly. I'm convinced after reviewing several reports on general aviation accidents, that you can ensure your flight safety, by improving your proficiency. I've assembled some things you can do for your review. The list is by no means complete; feel free to expand as you see fit. First, there is the owner's manual, which, by federal regulation, must be on board the aircraft for flight. You can purchase or borrow one of these handy encyclopedias from your local flight center. This can be a great investment, especially if you fly one particular type of aircraft most of the time. Inside, you'll find all sorts of good information about the flying machine. For instance, there is an explanation of flight maneuvers. It may have been some time since you have flown these maneuvers and this chapter will refresh your memory to ensure you are following procedures correctly. An important section to read over more than a few times is the one on landing irregularities. Information on cross wind landings, etc., may help you get out of a tight situation and back on the ground safely. Additionally, more detailed Information on flight maneuvers can be obtained from special training manuals also available at the flight center. Farther on, there will a section on the stall characteristics of the aircraft. This will include stall speeds for various aircraft configurations and angles of bank. Notice particularly the configurations most used when you fly traffic patterns and approach to landings. It would be advisable to commit the speeds (maybe two or three at the most) to memory. If you're not the type who has a good memory for those things, write them down on a 3" x 5" card so you can have a ready reference while you fly. You can review them just prior to entering the traffic area. Stalling can be extremely hazardous at the low altitudes of the traffic pattern and place you in a situation from which you cannot recover before hitting the ground. Foremost in your mind, you should read and thoroughly understand the chapter on emergency procedures and operating limitations of the aircraft. These are items the aircraft manufacturer has decided are important enough to warrant your special attention. He has thoroughly tested the aircraft and its capabilities before it was delivered. The procedures are designed to help you safely recover the aircraft when it performs less than advertised. I've attempted to highlight some of the more important things, but don't stop here. The owner's manual can really be your best friend. It allows you the freedom to ponder the manufacturer's recommendations while your body is safe and sound on the ground. If questions arise, it's much better they arise there than in the air. So you've read the owner's manual and your confidence is overflowing. You now know things you never knew before and you can't wait to get in the seat and take off, but take a few minutes to further analyze your proficiency. As I said before proficiency is personal-an individual thing. Get out your log book. When was the last time you flew? What maneuvers did you accomplish? Are you embarking on a journey with passengers? There's nothing worse than not being in complete command of every situation when you've got an audience watching. If it's been a while since you last flew, you might consider a flight with an instructor. Nothing major, maybe just a few trips around the pattern, but it can be well worth It. He will ensure you're doing It by the book and, if you've developed some bad habits, he'll be there to demonstrate the right way. That's tough to do solo. Again, it's an investment in your future, and you know you're worth it. Maybe an instructor flight isn't necessary, and you decide a solo flight is more appropriate. Instead of just droning around doing area reconnaissance, take a little time out to practice a few stalls here, a steep turn there. You'll be surprised at how little time it takes. When you come back to the traffic pattern, instead of flying normal traffic patterns and landings, practice those short and soft field patterns and landings instead. Try to get in some crosswind practice. Maybe there are some airfields in your local area where a crosswind prevails. This will be beneficial when that cold front moves a little faster than you thought and the winds kick up. And it's great practice for going cross-country to a strange field when you're not exactly familiar with the surroundings or wind patterns. Cross-country is a whole 'nother ball game. This type of flying introduces more variables that can go wrong, and you must be prepared. Preflight planning is the .best method of preparation. The longer its been since you flew cross-country, the more preparation you need to do. Make sure you know everything there is to know about your airplane, route of flight, and the enroute weather. Weather is an important factor. It is the primary cause of many general aviation accidents. Accidents which were preventable If the pilot had just turned around and returned home. Instead, pressonitis caught him. Many times, the pilot didn't have the instrument rating to fly in weather, but, continued anyway. Clouds make it tough to see mountains and other obstructions, as well as contribute to carburetor icing and reduced aircraft performance. Some weather phenomena are always in season, so take a good hard look at the weather while you're still on the ground. Consider alternative routes of flight or delay the trip a day or two until the weather gets better. Additionally, consider the atmospheric conditions of your field of intended landing. What is field pressure altitude? If you're retreating to the mountains (i.e., high altitude) for the weekend, a high density altitude can drastically reduce your aircraft performance. If not accomplished properly, takeoff and subsequent climb out of ground effect may be impossible. Are you up to speed on leaning the engine prior to takeoff, if required? This procedure may be necessary If takeoff is to be successful. If you're not up to speed, a certificated flight instructor (CFI) at your home station can review the procedure on the ground with you prior to embarking cross-country. Don't be afraid of asking that 'dumb' question, especially if knowing the answer could mean the difference between life and death. Also, the winds can do interesting things in high altitude areas-from creating a very turbulent environment on final to gusty crosswinds in the flare. You must be prepared for all of them. If it's been awhile since you flew in a similar environment, then it's time to rethink your plans. Postpone the trip till fair weather prevails. Next time the winds kick up at your home drome, call your friendly CFI and get some good crosswind experience. You'll find it to be a great confidence maneuver. Pack a survival kit in case you have an unexpected forced landing. The items you choose to include are up to you, but it is a good idea to include water, something energy producing to eat, and most importantly first-aid. Once again, a great investment. I do this whether I drive or fly, and the best thing I can say is that I haven't yet had to use it. So you're ready to go. You've checked, double checked, and memorized the owner's manual, etc. You're gonna slip those glorious surly bonds. One more planning factor to remember. Know where the major traffic congestion will occur (i.e., other airport traffic areas, airways, navigation aids, terminal control areas, etc.). It's great to know all that we've discussed, but it can mean nothing if you get too close to some other aviating comrade. Call It clearing, see-and-avoid, whatever, just make sure you do it. Be especially courteous while in the traffic patterns of 'uncontrolled' or 'unicom' fields. I remember one time I was in such a situation. I made my base leg radio call only to hear someone else call base immediately afterward. Knowing that I wasn't flying formation with anyone, my head began spinning faster than a barstool to find out where this person was. Seems the individual was in more of a hurry than 1. This person had been behind me on downwind and turned inside my base leg to beat me to the runway. This act was totally unnecessary, discourteous, and most importantly, unsafe. It probably saved him all of 3 or 4 minutes. One final pitch for Safety. Safety should be your primary concern when you rent an airplane. Consider the safety record of Aero Clubs. Aero Clubs are actually about twice as safe as their general aviation counterparts-a significant difference. Aero Clubs offer other important benefits: good aircraft, good maintenance, good instruction, and relatively low fees. 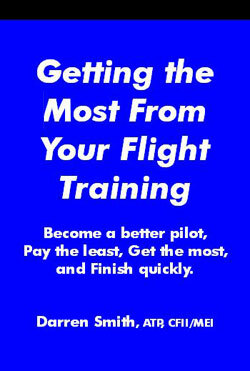 They allow you more flying for your dollars, and that contributes directly to your proficiency. If there's an Aero Club nearby, consider the advantages it may have for you. Proficiency-you must decide what it means to you. Remember, you're a pilot-a professional. You've got a responsibility to your fellow aviators, your passengers, and yourself. In an era where the dollar is a limiting factor in the decision, I've suggested some ways to improve your proficiency while not lightening your wallet. Also, where the expense was necessary, I've shown how to get the most out of the dollars you spend. Put them all together and you have a method of flying smarter, allowing you to fly safer. Give it a try. Staying proficient is a real challenge for most pilots. In order to retain your skills and stay current in the knowledge of your aircraft it requires time, money and suitable weather. Fly smarter and get the most out of the time you actually fly, and fly safely. In between flights review the aircraft owner's manual frequently.